The Osoyoos Indian Band (OIB) has an established reputation as visionary community leaders. Their progressive identity is built on a strong entrepreneurial history that includes ranching, trading, and small farming operations. Today, they operate and invest in various industries, including the construction, recreation, and agricultural industries. The OIB land encompasses 32,000 acres that stretches from Gallagher Lake, north of Oliver, to Hwy. 3 in Osoyoos. The vision of OIB is to achieve economic self-sufficiency for its members while consistently improving the economy of the South Okanagan in a manner that encourages sustainable growth in balance with the natural environment. The Osoyoos Indian Band are at the forefront of business development in the region, which has improved the business opportunities for local residents and provided a place to work and create for many entrepreneurs and businesses. The Osoyoos Indian Band has a long history of business development and creating long lasting business partnerships. The Band’s first long term lease relationship was formed in 1963 (for the Cherry Grove Golf Course) with a group of Oliver business partners. As early visionaries of the local wine industry, in 1968 the Band invested in its first business – Nk’Mip Vineyards, planting 40 acres of prima vinifera grapes. Today, Nk’Mip Vineyards has grown in size to 300 acres, making it one of Canada’s biggest privately owned vineyards. In 1989/1990, the Band partnered with one Canada’s biggest wineries, Brights, to build Western Canada’s biggest wine and beverage production facility. Today, this partnership is lead by Arterra Wines Canada, which offers visitor the opportunity to experience the Jackson Triggs Okanagan Estate Tasting Gallery and the Inniskillin Wine Boutique and Tasting Bar at Phase I of the Senkulmen Business Park. Capitalizing on the success of its vineyard, as well as its successful business relationship with the company that has now become Arterra Wines Canada, in 2002 the Band established the first aboriginal owned winery, Nk’Mip Cellars. 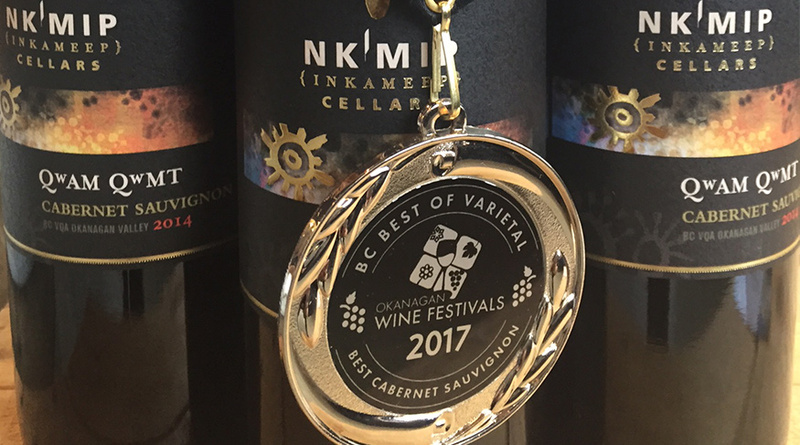 In 2016, Nk’Mip Cellars was named Winery of the Year in the prestigious Intervin International Wine Awards. In addition, the Band has many other successful business ventures, including the Nk’Mip Campground and RV Park, which the Band has developed into one of the largest campgrounds and RV Parks in the province, the Nk’Mip Desert Cultural Centre and Nk’Mip Desert Canyon Golf Course. Through their strategic business partnerships the Band also developed residential joint ventures at the Spirit Ridge Resort at Nk’Mip, the Residences at Spirit Ridge and the Canyon Desert Resort. The Osoyoos Indian Band continues to pursue in innovative development opportunities, including Area 27 – Western Canada’s only racetrack designed by Canada’s very own legend and race champion Jacques Villeneuve. With budgets in excess of $35 million dollars, these progressive and successful initiatives have ensured the financial independence of the Band who now govern their own health, social, educational, and municipal services. Over the years, the Osoyoos Indian Band and local and national business partners have developed long-term lease relationships and joint ventures that have created over 1,000 jobs. The economic success of the Osoyoos Indian Band is due to the vision of Chief Louie who, together with his Council, work tirelessly to secure the economic development of the region. The Osoyoos Indian Band continues its entrepreneurial spirit of its ancestors by seeking out new partnerships and development opportunities to add to the over 1,000 acres of residential, commercial, industrial and agricultural projects on its reserve lands.